So many people come to us for their logo to be created but they’ve given no thought to how they want to be perceived and how they want to people to feel about them. This blog post is here to set that right. Below we’re going to guide you through our tried and tested thought process we use for our lovely clients and next week we’re going to talk about all things “brand”. People buy from people, emotion is a big part of the sales process. They need to like you. How do you want people to feel when they engage with you and your brand? The answer to this question will depend entirely on who you are and the people you serve. Taking our brand of “2nd Floor” as an example, this was quite a difficult task. As our services appeal to such a wide audience we had to be gender non-specific, keep things approachable and professional, show our personality, our skill levels and demonstrate the high level of quality we bring to our work. We want people to feel warm and looked after when they come to our website. We want information to be clear, we want people to feel like they are in safe hands. If you’re a personal trainer, you want to be seen as professional, approachable and fun. You want people to feel empowered and excited to work with you. If you’re an interior designer, you may want to be seen as creative, knowledgeable, unique. You want people to feel inspired and invigorated by you and your ideas. Whoever you are and whatever your business is, you need to decide on how you want people to perceive you and your business and this needs to stay consistent at every touch point a person has with you and your brand. Whether it is on your website, Facebook page, Twitter, Snapchat, Instagram, in person or even on stage. Authenticity and honesty is always going to win out and work better for you than hiding behind a logo. Even with the prevalence of Facebook, a high percentage of your potential customer’s are going to have their very first interaction with you or your brand via your website. So you need to ensure that your website conveys who you are and what you’re about. Lucky for you though, that’s what we’re good at! This also means you need to think about who you want to attract, if you’re a personal trainer you don’t want to attract other personal trainers. You want to attract people who need a fitness transformation whether they know they need it or don’t. Likewise, you probably aren’t trying to attract children or really old people. 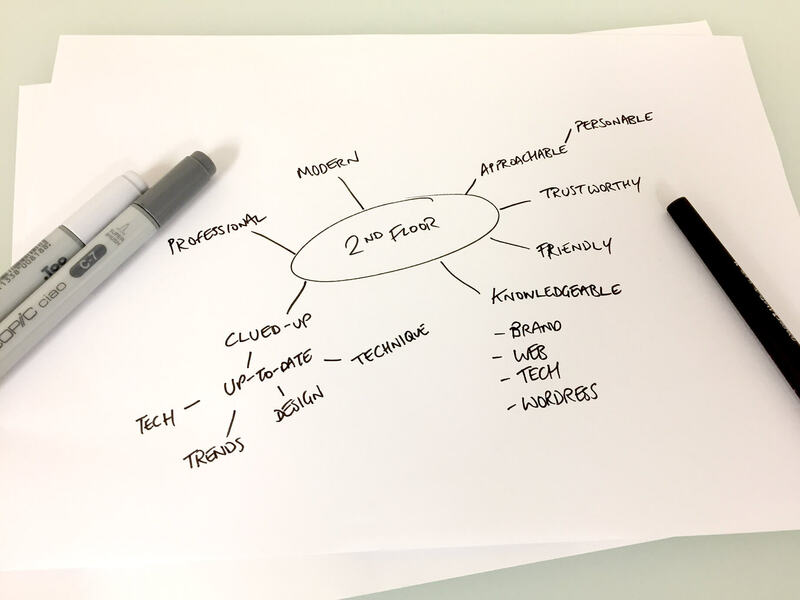 At this stage of the process of building out your brand and website, it is all about ideas generation and getting everything out of your head and onto paper (or screen if you prefer). This will help you to develop a cohesive message for your future customers. We call it mind-mapping, some people call it brain-storming. What do you need to think about for your mindmap? Your values, your target audience and demographic, what you’d want to be associated with and what not, colours, fonts, feelings, emotions you want people to feel. Here is what ours looked like. That’s ok, sometimes you need to talk these things through. In fact, most of the time it’s good to talk. Just get in touch with us, give us a ring and let’s talk through your ideas.